On April 19, the 2nd game of the 24th Asahi Open Championship was held between Asahi Habu and Challenger Fujii 9dan in Miyagi prefecture. Before the game, the score was 1-0 led by Habu. Fujii played Sente(made the first move) and he won the game with 129 moves. Now the score is tied by 1-1. Since Asahi Open Championship is 3 wins match. The winner of the next game will have big advantage. 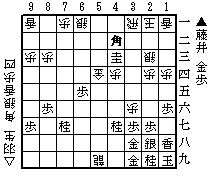 The diagram is at Habu's resignation when Sente(Black, lower side) dropped his Bishop on 4b. Sente has a Gold and a Pawn in hand. If it is Sente's turn in the diagram, there will be a mate such as Bx3a+ Kx3a R*4a K-2b G*3c K-1b(if K-1c instead, then Rx1a+ S-1b +R-2b(mate)) R-4b+ P*3b Gx2c Kx2c Rx3b+ K-1c S*2b K-1b S-3c+ K-1c +R-2b(mate). There might be more variations, but in any case, Sente should win the game.